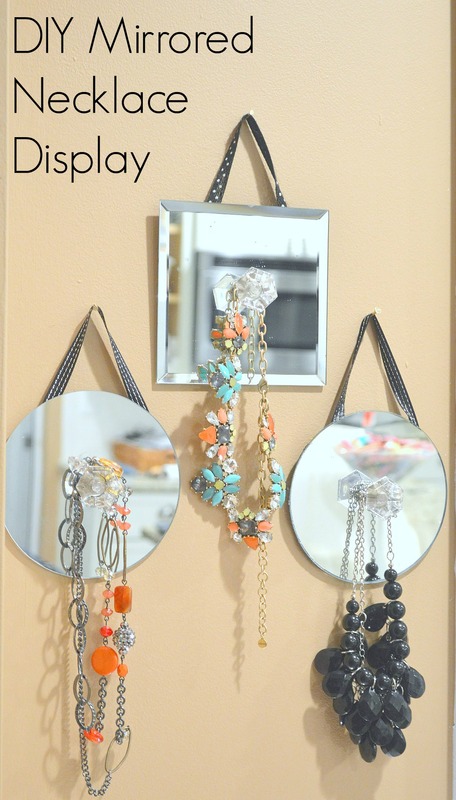 I thought it was such a simple and classic look and while I have a place where I am *supposed* to keep all my jewelry, a couple of knobs like this hung by the bed, would be great for lazy evenings when I don’t have the energy to walk to the closest. Yes, that happens sometimes. 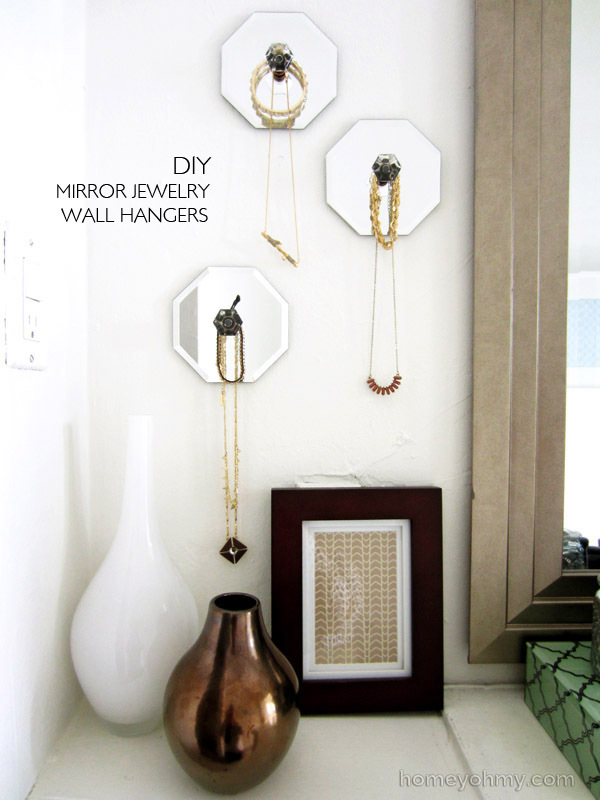 Before I get to my version DIY version of the necklaces hangers, I have to say, you should really go check out Home Oh My. There are more genius and beautiful ideas just like this one! 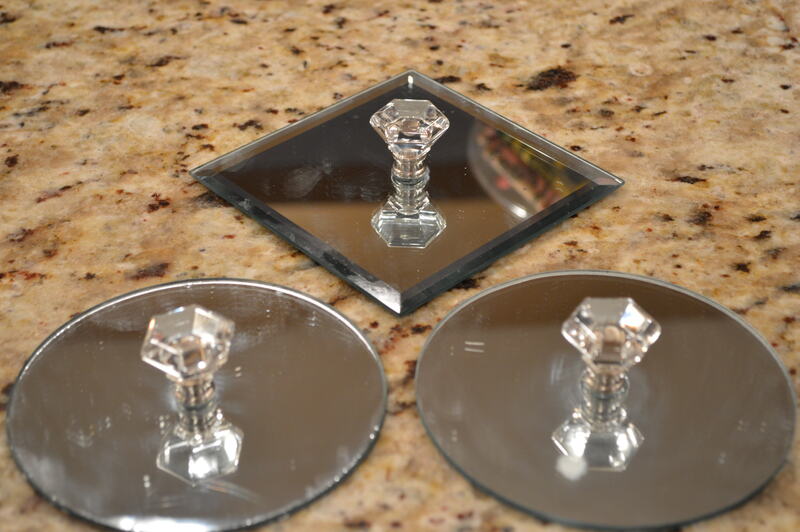 One reason (in addition to “it’s so pretty” and “it’s so easy”) that I was excited about making these is that I had some mirrors already and they were left over from centerpieces from my baby shower. Not my baby shower, as in like, before I was born, but as in my baby shower from when I was pregnant with my daughter. She’s 9. I’ve lived in 3 houses since she was born. Somehow these mirrors have made the moves unscathed until present day. There are the mirrors. 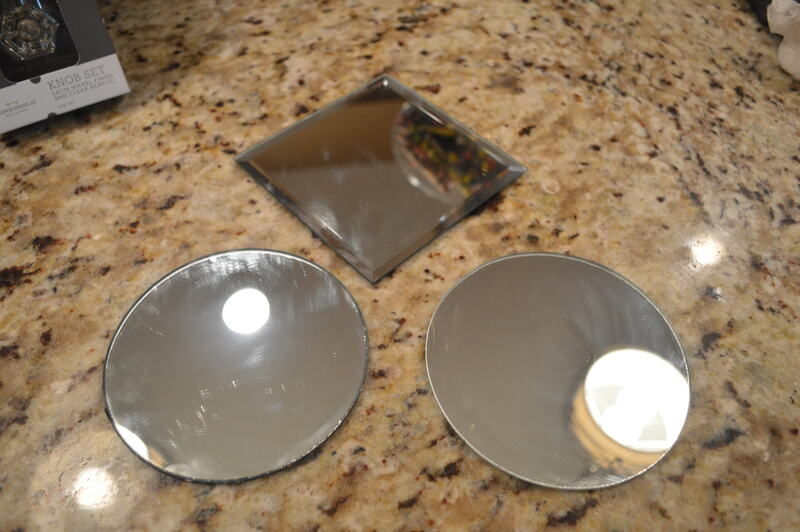 I have no idea how to take a picture of mirrors lying on a flat surface. I’m starting to get the hang of taking a picture of them when they are hanging, but when they are lying on the counter like that, I can’t seem to figure it out. These are the knobs I used. I grabbed them at Target. They were $14.99. I know I could have found them elsewhere for a better price, but because I already had everything else I needed for this project, I decided to go for convenience over bargain hunting. An important thing to note about the knobs, you want to make sure that you don’t get ones that already have the screw attached to them. I used Gorilla Glue to attach the knobs to the mirrors. I hadn’t used this before, but it was pretty straightforward. Read the directions and use as little as possible and make sure you rinse the nozzle when you’re done. Oh, and don’t get it on anything important like your skin or your hair. There they are, all adhered after a few minutes. This is where I got stuck. 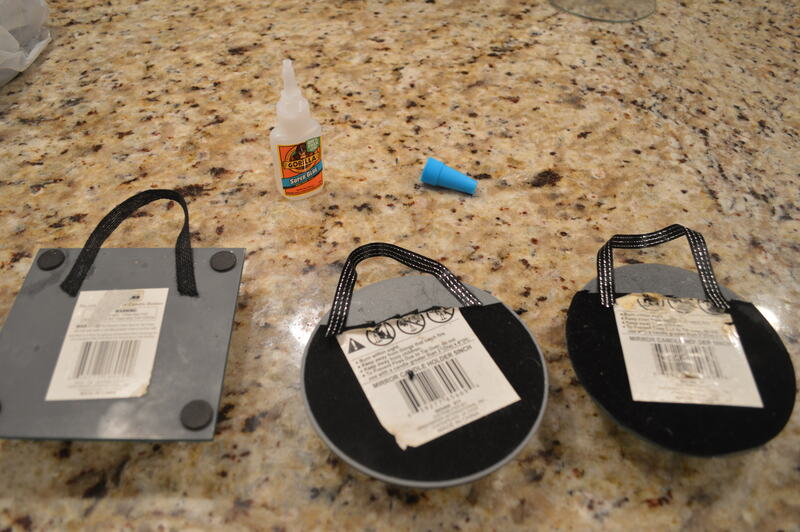 I was going to use command strips to attach them like in the inspiration project, but they wouldn’t stick. I don’t know why. But, I’m glad. 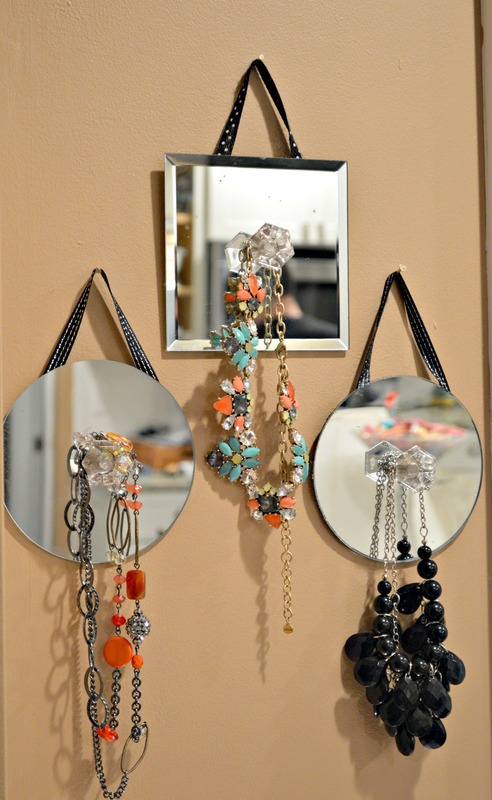 I had to improvise and I thought I would attach some ribbon to the backs of the mirrors and hang them on little nails. 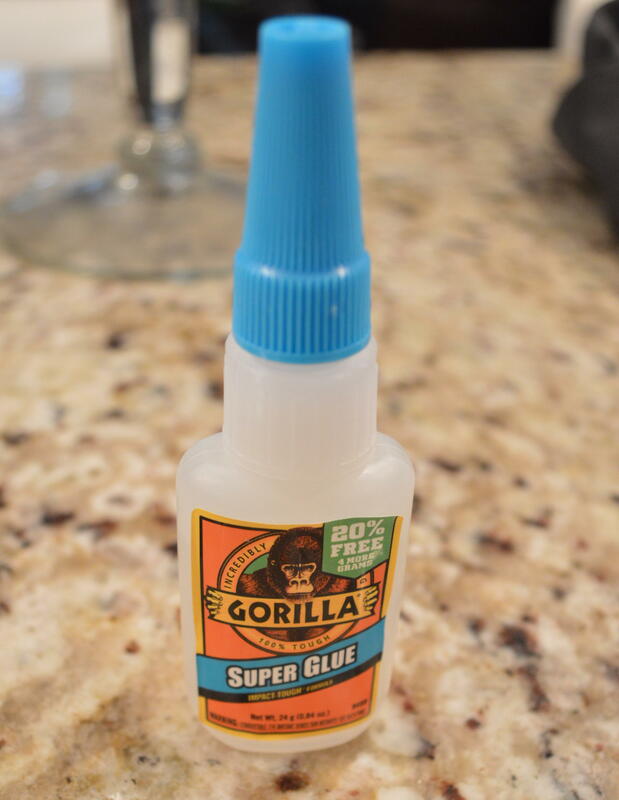 So I grabbed the Gorilla Glue again and stuck the ribbon on. I let those set up for a few minutes and then hung them. I hung them in the kitchen for now because I knew it would be the only place I would get any light at all to photograph them, but they will be moving to the bedroom soon.